Summer and early fall is Kevin Culbertson’s busiest time of year. As coordinator of OKCU’s six housing complexes, he works with a strategy team to plan projects, such as the Walker Hall remodel. He works with Risk Manager Lee Brown to ensure safety. He is eliminating paperwork for check-in and check-out procedures and furniture inventory, moving housing to a new software system. He handles the transitions from camp to camp all summer long. 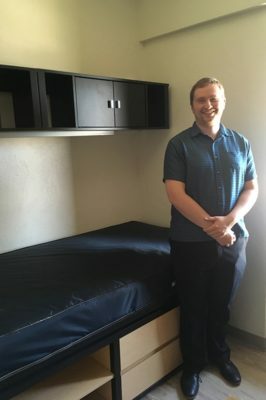 And as head resident, he’s making plans to build community and cultivate student leadership with the help of eight Methodist Hall resident assistants. 2017 was Kevin’s second year as head resident, and he worked to figure out what upperclassmen residents would respond to—always food, of course. But different students create a different culture each year, he said. In 2016, laser tag in the parking garage was a huge hit. This year, he’s increasing wellness activities; he’s looking at throwing a regular tai chi class into the mix. As a live-in staff member, Kevin helps camp sponsors find kids and once dealt with a burst water pipe until 3 a.m. He gets phone calls in the middle of the night, even in the summer. He feels like the entire campus is his home. When he walks his dog, outside is like his backyard. Kevin started attending camps and events at OKCU when he was in middle school. He grew up Methodist and has always supported the culture and mission of the university, he said. As an alumnus, he understands students’ frustrations and struggles and is better able to empathize with them, he thinks. A few things people may not know about Kevin are that he plays trombone, he’s an OKCU MBA student, and he once went to Kenya on a mission trip to refurbish a library and provide medical help.